Is LaFerrari Development Lagging Behind Schedule? After it stunned the world with its debut at the Geneva Motor in March, we haven't heard a lot from LaFerrari, the brand's upcoming 963-horsepower hybrid hypercar. A few test mules have been spotted, but that's about it. Rumor has it that development may be taking longer than expected. Are they true? At this point, all we have is conjecture from unnamed sources in various places, so take what you're about to read with a huge ol' grain of salt. The word on the street is that Ferrari engineers are still hard at work on achieving the car's performance and weight targets — namely, being able to kick the crap out of the McLaren P1 — which could explain why it hasn't made public appearances since the concept debuted in Geneva. Though it debuted a few months before LaFerrari, it's no secret that the P1 has been seen out and about quite a bit more. Our sources state that Ferrari is still hard at work to finalize the production-spec LaFerrari. Ferrari is further developing the LaFerrari in an attempt to outpace the McLaren P1 with their final production-spec. [...] It is not the first Ferrari that takes a significant time from introduction to market, the F12 also took a significant time from initial introduction til the first customer deliveries. But with a Ferrari as anticipated as the LaFerrari the stakes are even higher. -Not that it's going to matter to any of you guys, but I was told a couple of months ago by someone in intimate contact with a top engineer on the LaF project that there is a "big problem with the car". -Logic suggests that is the case and what I have assumed. Still in disguise running around Maranello, no appearances, no delivery dates, no new Fiorano times, and whilst all 499 could be sold out, they have still to allocate the last 150 cars and are clearly in no rush to do so seeing as they don't yet have a viable product to offer. 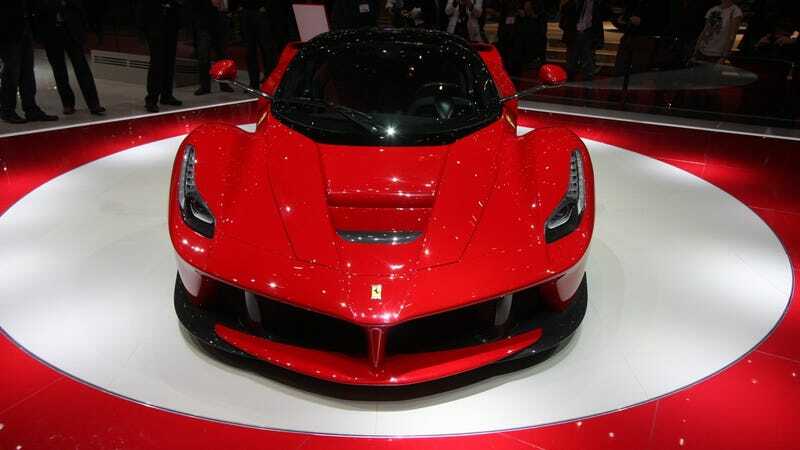 -Ferrari have not made any major presentations to the public of LaFerrari since the Geneva Auto Show. The word I heard in Maranello is that it won't be shown again this time until it is 100% ready and achieves the performance and weight targets it already announced. That will be in March next year at the earliest and still much work to do to achieve those estimate figures. Hopefully they will reach them. I'll say it once again: forum chatter is in no way the same as raw facts, so let's be skeptical about all of this. However, if any of this turns out to be true, I'm not going to fault Ferrari. Not this time. What they're developing isn't just any old flagship supercar (as if cars like the Enzo or F40 could ever be described as "any old," right?). They're building something with brand new technology, something that will usher their brand into the new era of performance. Hybrid hypercars are the future, and they represent the highest degree of tech that you can put on a car at the moment. That isn't something Ferrari wants, or needs, to rush out. If they really are taking their time to make sure they get it right, they are to be commended for it. We'll be thankful when the technology trickles down to cars the rest of us can afford. Do Hybrid Hypercars Represent The Apex Of Road-Car Tech? Until then, we'll keep an eye on LaFerrari's development. Have you heard anything about where it's at? Let us know in the comments.